Chicago Blackhawks GM Stan Bowman, like a lot of other NHL executives, has delved into college hockey to bolster his organizational depth. Free agent players from the ranks of the NCAA have found some leverage at the high end of the talent pool in recent seasons. So much so that Bowman has found the need to sweeten the pot to get at some of that talent. Has it paid off? Well, you got to see Kyle Baun Tusday and Thursday nights. I certainly don’t see him in an Indian head sweater come fall, but the former Colgate standout was able to parlay interest from a host of NHL teams into a cup of coffee in the show and a year burned off his two-year entry deal. Time’s gonna tell on guys like Baun and Tanner Kero (formerly of Michigan Tech) as to whether or not they can someday break into an NHL lineup. However, the ship has likely sailed on a much-heralded player who, at the time of his signing, was seen by some as a potential top-six center. I’m talking, of course, about Drew LeBlanc. Just so you know…he’s not. I have wanted to address the progress of the 2013 Hobey Baker recipient for some time in my weekly look at the IceHogs. 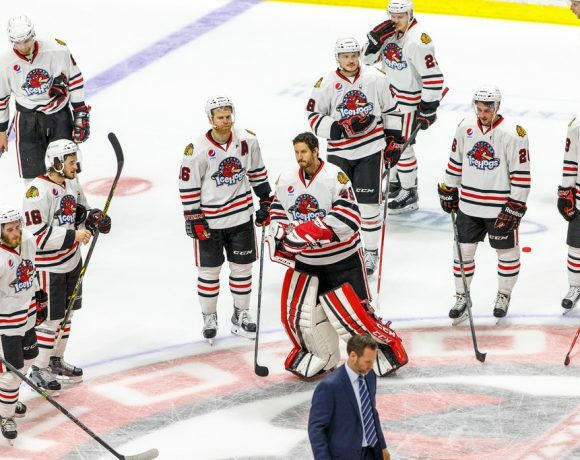 What with recapping what has been a successful season in Rockford and shining a light on some of Chicago’s standout prospects, I’ve been loath to tread down this path. With LeBlanc’s time in the organization nearing completion, though, I want to take a look at how Bowman has fared with recent free agents from the college ranks. Back in the spring of 2013, the Blackhawks brought aboard the St. Cloud State star, who had just finished his amateur career after a medical redshirt senior year. Bowman nabbed LeBlanc over other interested NHL clubs by signing him to a one-year entry contract and placing him on the Blackhawks roster. LeBlanc skated two games at the close of the season before riding out the Hawks cup run from the pressbox. As a result of the abbreviated entry deal, LeBlanc was a restricted free agent that summer and signed a two-year contract with Chicago. The second year of that contract was a one-way deal, suggesting that Bowman was fast-tracking LeBlanc for a spot in Chicago. At the time, it seemed strange to make that commitment to a college skater when Chicago had Brandon Pirri developing in Rockford. Going into training camp in the fall of 2013, it would be fair to say that both young players were scrutinized as to their NHL potential. Say what you want about Pirri and what his ceiling was with the Blackhawks; 35 goals in 103 games tells me that he can play somewhere in the NHL. With LeBlanc, answering the question of his big-league prospects will have to wait until he’s proven he can hack it in the AHL. LeBlanc came to Rockford and right away you were hoping he’d make good. He is a nice kid who works hard and is pretty sound as far as rink smarts. As his rookie season with the Hogs progressed, you could begin to suspect whether he could adapt to the pro game. He just wasn’t able to get a lot of shots to the net. The skating ability wasn’t on par with guys like Alex Broadhurst or Garret Ross. LeBlanc played in all 76 games for Ted Dent in 2013-14, totaling 22 points (7G, 15A) and a minus-four skater rating. I doubted that LeBlanc was going to wind up on the Hawks roster this past fall. He got NHL money and floundered on the bottom lines for the Hogs in 40 games this season. He has been a healthy scratch for much of the second half of the campaign; in the last two months he has dressed in just two contests, the last being on March 15. The numbers…four goals, two assists. I really don’t want to make this a slam on LeBlanc; he used his big senior season to his fullest advantage and got himself set up to take a shot at pro hockey. He may continue to play in the minors for a while. He could catch on with another AHL club that doesn’t have Rockford’s forward depth in a bottom-six role. He may get started on a career in teaching mathematics and be great at doing so. Probably would make an excellent coach. I just don’t think he’s going to see the business side of an NHL rink. This is where I focus on the decision made by the men at the top of the organization. Bowman rolled the dice on LeBlanc and is staring at snake eyes. The stakes haven’t been as high, but he has taken fliers on other college free agents. Last season, it was Matt Carey who drew interest from Bowman, enough to burn the first of Carey’s two-year deal for a twirl around the dance floor with Chicago. Carey, who has spent most of his year on Rockford’s bottom six, has 10 goals and 11 helpers. He will be an RFA this summer. Trevor vanRiemsdyk was a college free-agent who has had some early success in cracking Joel Quenneville’s defensive rotation. He has had two major leg injuries in the past two seasons, however, and is currently convalescing after wrist surgery. JF(Me): Is it a foregone conclusion that Drew LeBlanc has played his last game for the IceHogs? I can’t see him re-signing with the Hawks organization. Does he have any future in pro hockey as an NHL prospect? CB (Block): If the IceHogs avoid an injury spree to the forward group, I wouldn’t be surprised if Drew LeBlanc were not to get in another game. It appears the Hawks have finally reached the point to say “it’s enough now,” and move on from this player. I don’t see why they would re-sign him. Super nice guy, but he peaked at college and hasn’t shown much improvement since his arrival. Certainly not enough to warrant taking time away from Broadhurst, Hinostroza, Rasmussen or Carey. Dane Walters will get in before LeBlanc. As far as having a future at all, I suppose you never say never, but it is highly unlikely. JF: In his time in Rockford, what would you say was the biggest deficiency in LeBlanc’s game; where did Stan Bowman overrate his pro potential? CB: In retrospect, it was a terrible signing. Just awful. Not only in the sense that LeBlanc was paid a good amount of money and didn’t pan out. But also how the insistence that they had to continue playing LeBlanc, especially in 2013-14, when it was obvious he was the worst center they had and it was taking ice time away from better prospects, I believe was detrimental to the developmental process as a whole. Danault and Alex Broadhurst at times had to be moved to the wing to accommodate LeBlanc’s presence on the nightly roster. LeBlanc wasn’t healthy scratched once in all of 2013-14, which was absurd when you compared his performance to others who regularly caught heat from the coaching staff. I suppose the Hawks felt they had to skate him as much as reasonably possible, given the second year, at NHL money, would kick in this season. They knew he was virtually unmovable, because of that one-way contract in 2014-15. So, I get why they tried to squeeze as much juice out of LeBlanc as possible. But it hindered the development of better young players. It was something to observe, for sure. To be fair to the Hawks, their amateur scouting staff weren’t the only NHL team high on LeBlanc’s potential. He would’ve gotten high marks as a good kid, good character and as someone who loves the game. All things that a true of LeBlanc. Unfortunately his skating holds him back. If you go back to training camp in 2013, when LeBlanc skated shifts with Patrick Sharp, the area of LeBlanc’s game that stood out was his hands. I think they thought they would stick him with Kevin Delaney (Chicago’s skating and skills development coach) and the skating would improve enough to the point that it would be passable. It didn’t turn out that way. JF: So…have the Blackhawks learned their lesson or will we have guys making NHL money who will be lucky to crack the Hogs lineup? CB: I don’t think we’ll see another situation like LeBlanc any time in the near future. Meaning, signing a college UFA to a one-year entry and burning that year right away. It would take an exceptional talent who unquestionably is ready for the NHL. The Hawks are prestigious enough of an organization to pull one of those types of signings off if it comes along. But, a LeBlanc type who arrives with so much uncertainty-no. They’ll focus on younger players with at least two years of entry-level status from now on as a general rule. I don’t think we’ve seen the end of one-way contracts stashed away in Rockford, but that’s a separate conversation. JF: Matt Carey hasn’t had a terrible season. At age 23, he seems to have shown enough upside to merit another contract. Kyle Baun, like Carey, got his first year of his entry deal burned after signing by coming up with the Blackhawks. How does a guy like Baun (and Carey, for that matter) fit into the organization’s plans? CB: Baun is a body for Rockford next year. I think it’s important for Carey to finish strong. He’s been a healthy scratch on occasion. Carey probably gets re-signed but I don’t see it as a lock. Baun plays a hard, north-south game. That’s essentially what Matt Carey’s been doing. Carey’s biggest asset is his one-timer. He has to keep his game simple because there isn’t a lot of depth there. JF: He has played on both special teams, though I don’t know if he’s the best penalty killer Rockford has. Unlike LeBlanc, he only has a year of college hockey under his belt (not counting the year he was ineligible). Is he of the make-up that he is able to flesh out more of his game? Where does Carey focus on stepping up, assuming he gets tendered by Chicago? CB: Well, Carey was a late bloomer. He was a 22-year old freshman when he finished up at St. Lawrence. The mentality was he was at an age that he had to make the jump, that staying and playing college at 23 could work against him. I see Carey as a depth minor leaguer. There’s nothing wrong with keeping him around. It’s good to have those guys for stability in the AHL roster. He’s a long shot to make it at the NHL at this point. JF: Is bringing in college free-agent talent and setting them up with sweet deals (like LeBlanc’s one-way contract this season) send the wrong kind of message to guys who have been drafted and trying to play their way up the ladder? CB: It probably doesn’t help morale, but at the end of the day, each prospect should hold himself accountable for where they’re at. The Hawks went out and got Trevor van Riemsdyk because they weren’t convinced some of the guys already in the mix would be able to make a permanent jump into Quenneville’s lineup. Ultimately, that’s on those players. The Hawks are also on this binge of signing college UFAs because they’re running into issues securing their own graduating college talent. The business is changing and I think the players are beginning to understand that’s a big part of the process. JF: Are guys like Paliotta and Baun better off in Chicago or would they benefit from some game action in Rockford? How is Quenneville going to break them into the lineup, if that was an enticement for them to sign? 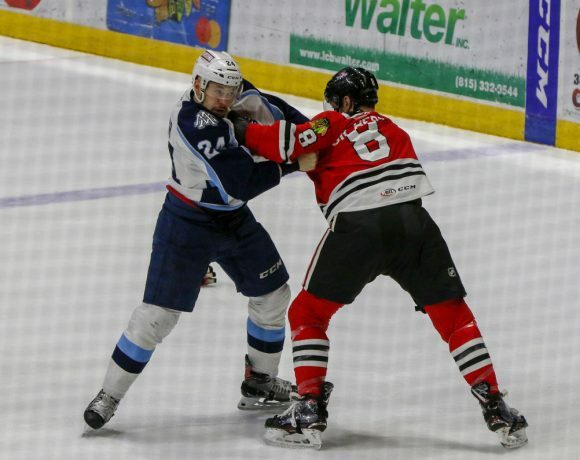 CB: Well, they’d absolutely be better off playing more games and more ice time in Rockford, but because of the position each was in, they used leverage and took advantage of the circumstances. Good for them. Both will be IceHogs next season. If Quenneville is being forced to play them, he should have played at least one of them in Buffalo. It could all still turn out okay and Colorado could wind up being a meaningless game this Saturday and they’ll get in their game. But Quenneville is also in the middle of a battle for the division and home ice in at least the first round. The last thing he’s going to worry about is getting two kids who don’t yet belong in the NHL, in an NHL game when every point matters. I can’t really criticize him for not playing them. They’re not NHL talents at this point. That’s not his problem. JF: Bowman has drafted a lot of players who have been heading to college, delaying the need to sign those picks right away. It seems like the organization is going to have to make the adjustment to getting those players under contract once they’ve developed. How does Bowman set upon making things easier on himself? CB: That has been the recent philosophy. It’s something to keep an eye on, for sure. They’ve gone that way (drafting college bound players) because they got burned on a few junior players that didn’t pan out. Ludvig Rensfeldt, Josh Unice, Maxime Tanguay and Teigan Zahn come to mind. All wasted picks. But now they have so many picks invested into college players who now see they have options or can leverage the Hawks for sweeter deals. There’s only so many spots under the 50-man roster limit at the end of each year to use in attracting or pitching to players on fence. First round picks will always be whoever is the best player available on their board, regardless of where the player is headed. Second round and beyond, I wonder if they’ll be a little more open now to drafting junior players in the middle rounds. JF: How much do you see Vince Hinostroza and now Tanner Kero factoring into Ted Dent’s lineup? Neither guy is real big…Hinostroza really looked little out there this weekend. Was it a good move for him to leave Notre Dame after two years? CB: The Hawks wanted Hinostroza out of Notre Dame now, after two years with the Irish, because had he stayed another year he could have defected and gone UFA like Kevin Hayes. Because Hinostroza played USHL the year after his draft, it would be four years since his draft next spring. That would have meant the Hawks would have had 30 days to sign Hinostroza from the time he made his intent to forgo his final year of college eligibility, if he’d decided to leave after his junior year. One would like to think Hinostroza wouldn’t consider going that route since he’s a Chicago area kid, and lifelong Hawks fan, but if he had a monster junior season there could potentially be people advising him that he’d be better off ditching the Hawks and hitting the UFA market. In a perfect scenario, Hinostroza would have stayed another year and worked on the holes in his game. But he is 21 now and it’s about the time skilled prospects make that jump. Hinostroza’s legitimately in that 5’9″ ballpark. I didn’t think he was out of place at all last weekend, so I suspect he’ll be a regular moving forward. He’s a pass-first mentality and I already see that being an issue as he’s passing up good looks to aim for lower percentage chances. I haven’t seen much of Kero so it’s hard for me to comment. Kero’s a left-shooting center and they already have Alex Broadhurst (a lefty center) playing out of position at left wing. Kero will get in and they’ll reevaluate it at that point. JF: It’s kind of a catch-22; you want these kids to get better but if they blossom into potential stars the risk of losing them is becoming a potential pitfall. Hinostroza was a sixth-round pick in 2012 and may have been more difficult to sign than Dillon Fournier and Garret Ross, two guys who were drafted ahead of him but came out of juniors. The landscape continues to change in regards to college players, huh? CB: I don’t think we’re at a point where any team should be leery of drafting college bound players. There’s definitely a new game at play here though. And it works both ways. Someday it’s likely that the Hawks will be on the receiving end of a player walking away from his drafting team. And no one on this side of the spectrum will be complaining about how the system works on that day. Block and I had the preceding conversation Monday night before Baun took the ice against Minnesota. 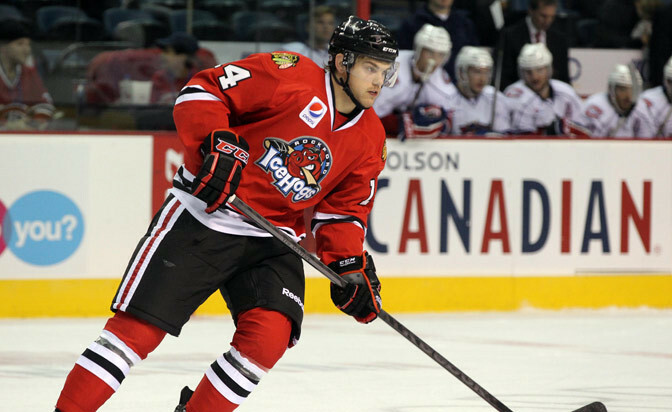 Hinostroza played his third game for the IceHogs Tuesday in a 5-2 win over Milwaukee. So far, he seems reluctant to shoot the puck but I think that will pass as he gets used to his team mates. He got blown up pretty good along the boards by Taylor Aronson late in the game. Who came to his defense and engaged Aronson in fisticuffs? Matt Carey. 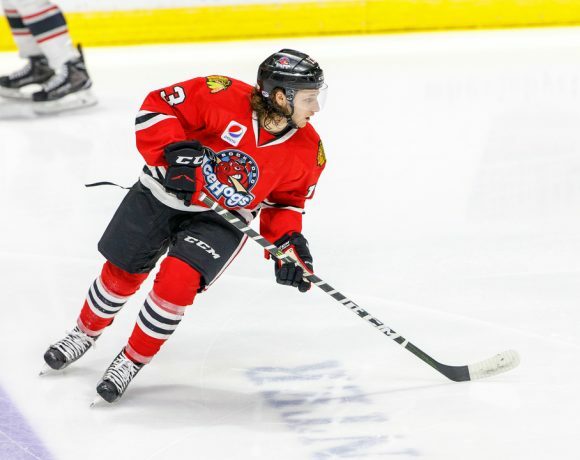 Kero scored five minutes into his IceHogs debut Thursday night. I suspect we’ll see him as well as Baun in Rockford next season, along with Hinostroza (not in the lineup Thursday) and Michael Paliotta, the two Bowman picks that signed with Chicago this spring. We’ll have to see next season how the college talent signed by the Blackhawks pans out. In regards to LeBlanc, it looks like the organization has made up its mind-and maybe learned a lesson. High On The Hog: Ouch!